Gold Standard. Part 2 … Ron Paul has entered the match! Ron Paul recently announced that he will be entering the race to become the Republican candidate for President of the United States. One of his well known views is that the U.S. should return to the gold standard. So in honour of Mr. Paul’s announcement I have decided to continue my discussion on the gold standard. The first post did not really deal with gold itself so much as establishing what money is and how fiat currency is differs from the gold standard. The first major problem with gold is its supply. With a fiat currency a central bank can use monetary policy to increase or decrease the supply of money of an economy. With gold you are limited by how much of it you can extract from the ground. When an economy starts to slow down a central bank will add money to the system in order to keep things moving. Gold does not allow for this. If things start to slow down in an economy people will tend to hoard money, especially at the low inflation levels that are associated with the gold standard. With the decreases in spending the economy gets worse. Some argue that this is a good thing, that economies should correct themselves from time to time to remain efficient. If we look instead to an international scale we see that as the world’s economy grows there needs to be more money to go around. Since gold is in such limited supply we would run into shortages that would drive the price of gold up. This would benefit some countries and harm other in a way completely outside of their control. Also, since the amount of currency issued is related to the value of the gold in a fixed proportion this would actually cause inflation. A very low level of inflation is the main feature that proponents of the gold standard mention. So a problem arises because while it is true that inflation levels are low under a gold standard most of the time, so is stability. The ability of an economy to absorb shocks is diminished. Let’s looks at an example. Fake Canada trades with the Fake U.S. and both are on the gold standard. Each have issued an amount of domestic currency equal to their gold reserves. In this fictional example let’s say that Canada is running a trade deficit with the U.S. meaning that they are importing more than they are exporting. The difference must be paid in gold. So Canada sends gold to the U.S. and must reduce the amount of domestic currency in circulation. This forces prices to drop, and interest rates and unemployment to rise. Gold bugs (people in favour of the gold standard) argue that this is how it should be, that the correction is a good thing and is required. So it really depends on your personal beliefs here, but I am guessing that the people that lose their jobs or have increased mortgage payments to help with this correction would not argue that the gold standard was the better option. Another issue with the gold standard is of course is the gold is now used for many things other than money. Gold is purchased as an input material in industry and so fluctuations in demand for say, computers could affect the price of gold. This would cause the value of currency to change as well. We certainly do not want the industrial demand for gold to influence our currency. Finally if we are talking about the real U.S economy we have to understand that the amount of currency in circulation is enormous. If they were to change to the gold standard there would be massive deflation. When deflation hits people stop spending all together because they believe that prices will continue to drop and hold onto their money waiting for the lower prices. This is of course disastrous for the economy as everyone is holding money and not spending. So this was a scattershot look at the gold standard. I will likely address this issue again sometime but for now at least we have taken a very broad overview of why it is unlikely the gold standard will ever return. I’ll come back to the gold standard when I have the time, it ended up being a rather big topic. I didn’t want March to roll by without a post so instead let us talk about the Canadian Election. First, here is something you may not have heard of before. It is something from basic game theory called Hotelling’s Law. I will not be discussing the validity of the term “law” in this post. I will however give a brief overview of this law when applied to political parties. In the original game there are two political parties. 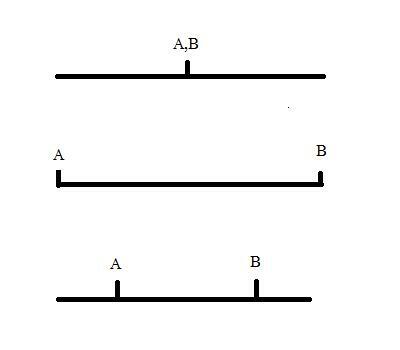 A and B. We depict the political spectrum as a line that goes from left wing to right wing, pretty standard stuff. In this game voters are evenly distributed across the spectrum and they vote for the party who’s platform is closest to them on the political spectrum. I will give three examples to clarify. Ignoring my terrible paint image accuracy we see in the first game that both candidates position themselves exactly in the middle of the spectrum and each player gets 50% of the vote. This is actually the final equilibrium point and I likely should have drawn it last but I didn’t. The second game is where each party positions themselves at the extremes of the spectrum. In this case. both parties still get 50% of the vote but it is NOT in an equilibrium state. You see, either party can move one step towards the other player and instantly capture more than 50% of the vote and win. In the third game I don’t know the exact payoff but each player gets all of the votes on the outside of their position and split the votes in between their two positions evenly. For the same reason as game two this is not an equilibrium, So the point of this is to see that with two parties the only smart move is to move as close to the centre as possible. Now I understand that there are some major flaws in this idea, mostly to do with the even distribution of voters on a political spectrum and that voters will always vote for the party that is closest to them but it still interesting to work through. Now lets see how we can use this little bit of game theory and apply it to the current political situation in Canada. 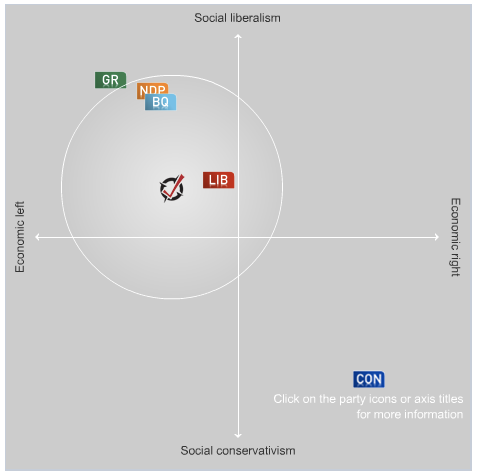 We are in an election and to help everyone make the decision of who they should vote for the CBC has come up with… THE VOTE COMPASS. It’s so easy! You answer a few questions and the website tells you which party you are going to vote for. Just like that, no need to waste your time keeping up to speed on current events. Here is an example of a vote compass result. Don’t get too excited, that is not my result, it is just the first hit on Google image search when I searched vote compass. 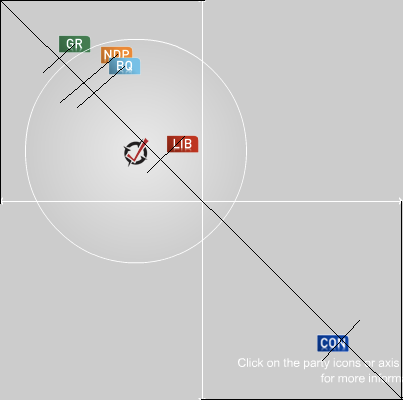 The positioning of the parties on this grid was determined by “a team of Canadian political scientists, including an advisory panel comprised of the country’s most prominent scholars in the study of electoral politics”(from the FAQ). So you know it is accurate. I thought to myself I wonder what Hotelling (from 1929) could tell us about this grid. The most obvious answer when you look at the party distribution is that the left is a fragmented mess that shares votes and has no real hope of beating the right unless they ditch some of the parties BUT that would be too trivial an observation for this site and its readers, wouldn’t it? Instead I will try something totally, legitimately, 100% scientifically proven, really valid. Yes that is right. I drew a line from one corner of the grid to the other. I then placed a marker on the line in the location for each of the parties. You can see the extreme accuracy of my lines in the picture. The length of the line is 567 pixels in total and from now on all lengths are in pixels. The distance between the Conservatives and the far right is 85. The distance between the Conservatives and the Liberals is 259. The distance between the Liberals and the Bloc Quebecois is 94. Everything to the left of the Bloc is 134. I will get into that area in a bit. I’ll spare you the math here. Remember that two parties split the distance between them 50/50. Here are the total number of pixels “voting” for each party. Totalling 99.52% which means my crappy MS Paint skills are not 100% accurate surprisingly. So the issue here is that the Bloc does not run candidates in all the provinces so the uniformity of the voters should go right out the window. Strange thing is that the Bloc is 17 pixels away from the NDP which gives them a total of around 55 total pixels or 9% of the vote. 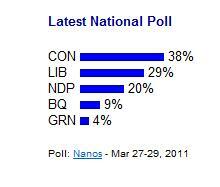 This leaves 23% for the NDP and Green to fight over. So there you have it, based on the compass provided by all the latest experts and a very loose interpretation of Hotelling’s Law you have the official Webernet.ca prediction for the election outcome. In case the results change and lose the surprise factor of my outcome, here is a small screenshot. Some of you might say that I rigged the image or something but to be honest, that would take so much more effort that just doing these calculations. So it appears the only way the Liberals are going to win this election is to move more to the right. Or of course form some sort of coalit… nah that is another post entirely. Hope you enjoyed this one, I did. The Canadian government has decided to block the takeover the Potash Corporation of Saskatchewan by the Australian company BHP. Potash is used to make fertilizer, you can find lots of information from any major news source. The premier of Saksatchewan made a special visit to Ottawa to make sure that the sale of the company was blocked. You see, the provincial governments have the power to regulate and tax resources in each province but only the federal government has the power to block the sale of a private company to a foreign interest. And they did. They stopped that sale cold. Last I heard the offers for the hostile takeover were far below the market price for the shares and way below the peak of the company’s shares before the all the badness in 2008. The numbers we are talking are something along the lines of $135 offered, $145current value and over $200 peak. These are all numbers I am just pulling from memory at the moment but I can assure you they are close to the real figures. So the offer that was on the table was blocked by the government before it could even be rejected by shareholders, which I am guessing it would have been. – It is a strategic resource. There has not really been much elaboration on any of these points but most have pretty automatic arguments built in. Sorry, I forgot the big one. This is not a net benefit to Canada. Are they saying that the bid wasn’t high enough? Did they do a cost benefit analysis and one outweighed the other? They must have. What would push the benefits over the tipping point for them to allow this type of sale? Are there different levels of net benefit for a natural resource versus say a car company or a technology company? Does the percentage of the world’s supply that we own play a factor? Why potash and not oil, nickel or any other resources? These are all things that we need to answer. I would like to take a trip back to a subject that was popular in June. G20 summit, I wrote about it then so please go read that post too. At the conclusion of any major summit of this nature there is a declaration released from all of the countries that attend. Toronto was no different. I think I linked to it in the past but here it is again. I would like to draw attention to the portion of the document starting at section 35 (page 7 in the PDF). This is the section entitled “Fighting Protectionism and Promoting Trade and Investment”. Now I realize that the guy that had to type up this document, me, and a few journalists that were forced are the only people that read this release but we really need to think about what it says and what it means for our policies. I fully supported the G20 summit. You need to have conferences like that to get things done. There were some issues with the execution but overall I think it was a good thing. My problem is that we spent a billion dollars talking to other countries about the greatness of open economies, the wonders of mobile capital and how protectionism in this financial crises will not help anyone and then we do the exact opposite. Supporters of this decision to block Potash will say that it does not constitute a new policy, and that we are not setting up large barriers, that it is a one-time thing. It could be a one-time thing, but no one knows because the true reasons have not been released. Seems like the commitment we made in that document doesn’t hold much weight once the polls start turning against the idea. Maybe in the next few days the reasoning for this action will be released. Of course, if in a week the bid from BHP is doubled and the deal is approved, we will know exactly what the issue was. This was actually just a elaborate bargaining tactic before the final sale was closed. Ontario Online Casinos – Place your bets! The government of Ontario has announced that they plan to have an online gambling site up and running by early 2012. Atlantic Canada is thinking the same way and BC recently launched its own online gambling site called www.playnow.com. It seems like something that we should talk about. Is a government run online gambling site a good thing? We will try to address both sides of the answer. There are a number of studies that suggest that a large part (70-90%) of gambling revenues from casinos and lotteries come from just 10% of the people that play. This of course means that the entire system is setup to take money from the small percentage of people that are likely addicted to some form of gambling. The government is knowingly taking money from the citizens that it should be helping. People use their money to gamble in the hopes that they will somehow strike it rich without having to work hard for it. They forget that the best way to be better off is to save, get a good education and work hard. The pipe dream of hitting it big becomes their main focus. This kind of falls in line with the encouraging addiction idea but I thought I would include it. If we encourage people to gamble, gambling addiction will become a larger problem and we will end up paying more to solve the gambling related problems. More theft, addiction counseling, etc. The government runs lotteries, which are gambling. Slot machines, horse racing, bingo, all gambling. Online casinos are just another form of gambling. It is not a new thing for governments to make a profit from this vice. The only reason they have not done it up to this point is because the government moves slowly and online gambling is a relatively new phenomenon. People are going to gamble online regardless of whether the site is hosted in Belize, England or Canada. The government might as well get its cut of the market. Having the government run the system also allows regulation and it reduces the likelihood that people get ripped off by shady foreign sites. People are doing it anyway so why not regulate and tax it. The BC site was the first one in North America to legally offer online gambling. Everything before that was illegal or hosted in other countries. I don’t think it is any coincidence that it launched soon after the American government passed a bill that would allow online casinos to open in that country. Remember when we opened the casino in Windsor and then they opened a casino in Detroit soon after? A poll on the CBC website is currently showing as 21% for and 79% against the idea of government run casinos in Ontario. It does remind the reader that it is not a scientific poll. With those kind of numbers I can’t imagine there will be much demand for the site. It will likely close down soon after it opens due to lack of interest. Oh, I almost forgot to mention, don’t try going to that site in BC because it crashed soon after launch due to the servers being overwhelmed by the traffic. They are in the process of upgrading it so that it doesn’t crash right away when they re-launch it.